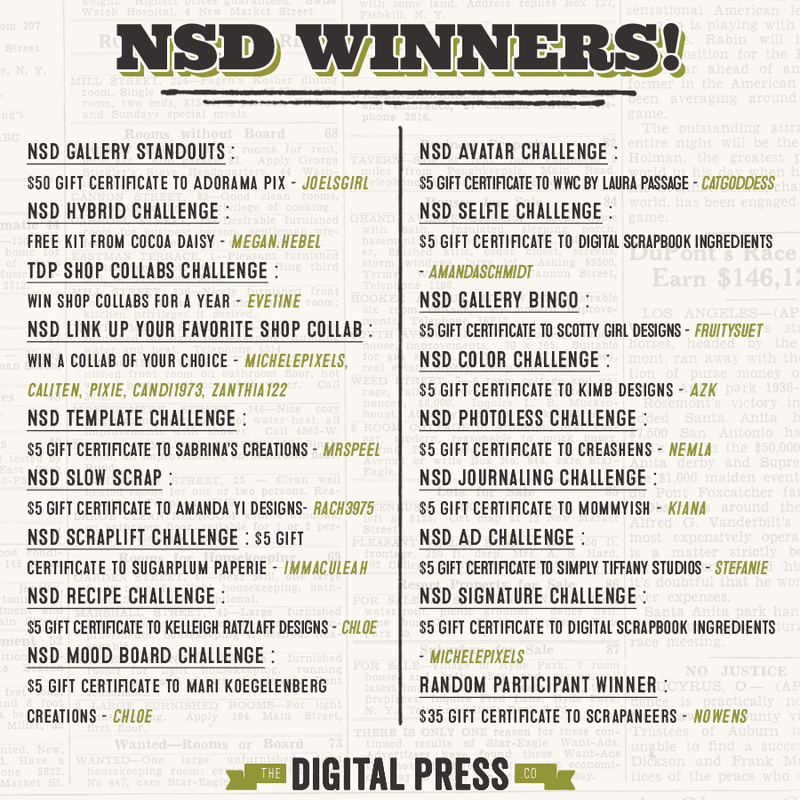 Everyone here at The Digital Press is so grateful for the participation of our team and our customers in our NSD challenges. This was our first big event here at TDP and your support means the world to us. We enjoyed looking at all the gorgeous eye candy and fantastic journaling throughout the week. I would like to offer a very special thank you to Rachel, our creative team manager that made sure this forum event went smoothly and our creative team who made some absolutely fabulous challenges. Now.. for our winners! Congrats to all winners! And thanks everyone for participating!! It was lots of fun! Woohoo! Thank you so much for those fun challenges, they were awesome and I love the pages I created thanks to them. Winning is just the (terrific) cherry on top!! Congrats to all winners! Thanks so much for hosting great challenges and seeing my name there is indeed just the cherry on the top. Congrats everyone! It was lovely to see so many people participate and have fun! Congrats to the winners and thanks for playing along and making this NSD a great one! Congratulations to all winners! It was fun! Thank you! And thanks for having such a fun NSD week! Thanks to everyone that played along and made it so fun! Congrats to all of the winners! Thank you for giving us such a fun, creative, week-long celebration! oh my!! thank you for the challenges and yes, it's lovely to see my name there!! !